The Oral-B Pro-Health Vitalize Advanced toothbrush is clinically proven to remove more plaque than a regular toothbrush. It removes up to 99% of hard to reach plaque. Our Bacteria Guard Bristles help keep your brush clean for up to three months. 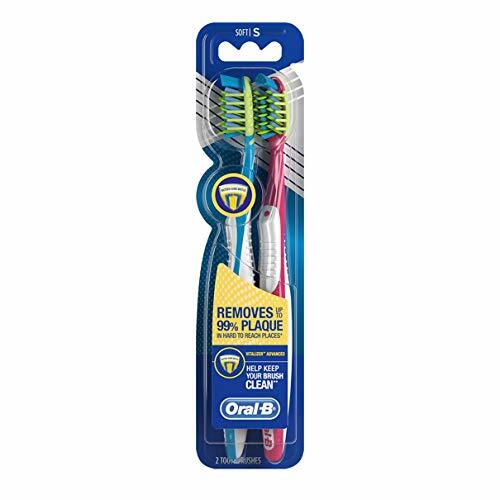 This toothbrush features unique Cross Action Bristles that are angled in opposing directions to lift out and sweep away plaque. Oral-B, Trust the Brand more dentists use themselves worldwide. Based on a single-use study. inhibits microbial growth that may affect the bristles. The bristles do no kill bacteria in the mouth or protect you against disease. Always clean the product thoroughly after use.